This high temperature tape is heat resistant and heat reflective. It includes self adhesive on the back side, with a backing paper protecting the adhesive. For applications involving regular repeated movement, such as a bellows or cable track system, we offer and recommend an "AMA", or Aluminum-Mylar-Aluminum coated fiberglass. The aluminum coated Mylar withstands repeated flexing better than foil coated fabrics. Also available is an AMA-F-SR fabric, which is AMA on one side of a Fiberglass base cloth, the the other side being Silicone Rubber coated. 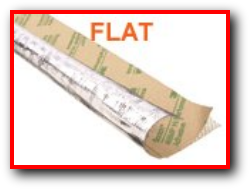 Heat reflecting tapes are available in sizes from 1/2" through 40" wide, and is available from the Foil coated Fiberglass from stock. Tapes from the other available materials are by quotation.